After a book signing tour in South Korea, author Andres Marasigan (TJ Trinidad) awaits his flight back to Manila. Meanwhile, Sam (Yeng Constantino) sets foot in South Korea for the first time. Not quite ready to face the reason she's in the country in the first place, she buys herself more time by staying at the airport. The two meet and spend the day together, talking about their lives, time, and everything else in between. Two Filipinos meet at an airport and start opening up about their lives to each other immediately. TJ is a TV, film, and theater actor most recently seen in the 2017 show Mulawin vs. Ravena. He was also in the thrillers Sin Island (2018) and Bliss (2017). On stage, he was part of Red Turnip Theater's The Nether and The Necessary Theatre's The Normal Heart. Yeng is a singer, songwriter, and TV host. She was previously a judge on Pinoy Boyband Superstar and Tawag ng Tanghalan. This is her second film. Her first foray into acting was in the CinemaOne Originals 2013 indie film Shift. She's set to release her sixth studio album this year entitled Synesthesia. Aside from a few scenes at the beginning and end, the film is shot almost entirely inside South Korea's Incheon International Airport. This film won big at the CineFilipino Film Festival, bagging Best Film, Best Direction for Alec Figuracion, Best Cinematography, Best Editing, and Best Sound Design awards. The entire film only took eight days to shoot (five days in Korea and three days in Manila), and it was during the middle of winter in Seoul. The director says when they weren't working, the cast and crew spent their time in South Korea resting. This is Yeng Constantino's first acting role in five years. Billed as a romance starring popstar Yeng Constantino and TV's TJ Trinidad, the pairing alone makes the film admittedly intriguing. You simply don't see team-ups like this in mainstream films. TJ plays Andres, a self-help author who went on a book signing tour in South Korea. Despite the success, he is clearly discontented with his life. Yeng plays Sam, a 20-something traveling to South Korea to get to know the Korean father that was absent for most of her life. Sam picks up Andres' book at a bookstore, and they coincidentally meet inside the airport. Learning that they're both Filipinos and having time to kill, they decide to spend the day together. Despite being virtual strangers, they open up to each other immediately. They also experience most of what the airport has to offer, learning how to write in Hangul, doing pictorials, wearing Hanboks, and trying out the spa. This is the most of South Korea that we'll see, as the whole film never leaves the airport. While it's definitely an interesting premise, I thought the film wasn't able to introduce its characters well enough, and the way they opened up to each other immediately felt more jarring than interesting. I spent most of the time wondering why these two strangers weren't just sharing their life's secrets, but also talking in stilted philosophical lines that attempt to feel profound but don't seem to mean much. I thought TJ and Yeng had great chemistry, but that the script didn't allow them to explore it. The film was mostly symbolism after symbolism of time—the passage of it, the concept of "papunta ka pa lang, pabalik na ako," wanting time to stop, etc. It's like the film sacrificed emotion and plot to focus on the time metaphor. 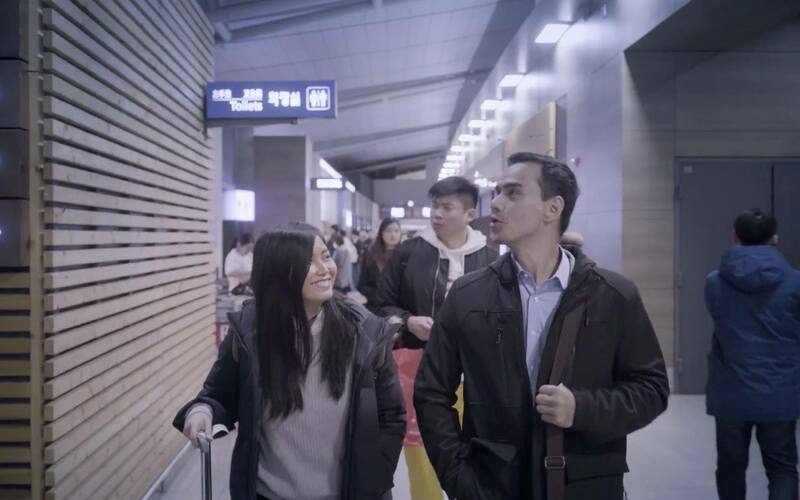 The plot was initially the two of them teaming up to find Andres' missing watch, only to abandon that search midway to explore the many random activities Incheon has to offer. The film was beautifully shot, even if the color made it feel too sterile. It made me think that if I have to be stuck in an airport for hours on end, I hope it would be at Incheon. If you're a fan of Korean films, this movie bears a similar style to well-lit K-Dramas and movies. I'd also recommend this to fans of Yeng Constantino, or anyone interested to see her as an actress. While the screenplay doesn't give her much to work with, she shows charm that livens up the screen even when scenes felt too dragging.